Small Iranian fast boats swarmed around U.S. warships in the Persian Gulf, and a man speaking heavily accented English threatened, "I am coming to you. ... You will explode after ... minutes," according to a video released Tuesday by the Pentagon. The Iranian boats appeared to ignore repeated warnings from the U.S. ships, including horn blasts and radio transmissions. In a four-minute, 20-second video, shot from the bridge of the destroyer USS Hopper, the small boats - including a bright blue one - can be seen racing near the wake the U.S. ships and crossing close to each other. From the Hopper's bridge, after spotting the approaching Iranian boats, a Navy crew member says over the radio: "This is coalition warship. I am engaged in transit passage in accordance with international law. Intend no harm." Often uneven and shaky, the video condenses what Navy officials have said was a 20-minute or so clash. It ends with a blank screen, as only the audio of the Navy's final warning can be heard, just after the voice warns that they are coming. "Inbound small craft: You are approaching a coalition warship operating in international waters. Your identity in unknown; your intentions are unclear," the unidentified crew member says. He then cautions the Iranians that if they do no steer clear they will be "subject to defensive measures." "Request that you alter course immediately to remain clear," the crew member says. The Americans couldn't believe what they heard next, CBS News correspondent Kimberly Dozier reports. After a pause, the man with the accent issues a final threat: "You will explode after (indecipherable) minutes." Earlier Tuesday, Iran's Revolutionary Guards corps denied that its boats sent threatening messages to the U.S. Navy convoy, and it defended its right to ask American vessels to identify themselves. The Guards have said their boats approached the convoy early Sunday and asked the U.S. ships to identify themselves, then allowed them to continue into the Gulf through the Strait of Hormuz, a prime Middle East oil-shipping lane. "No threatening messages were exchanged," state television quoted an identified Revolutionary Guards official as saying Tuesday. American officials said the Iranian boats harassed the U.S. vessels and threatened to blow them up, calling the incident a dangerous provocation as President George W. Bush prepared to leave Tuesday on his first major trip to the Middle East. The White House called the alleged incident "a reckless and provocative act," reports CBS News correspondent Mark Knoller. A top U.S. Navy commander in the region said Monday that the Iranian boats radioed a message "to the effect that they were closing (on) our ships and that the ships would explode - the U.S. ships would explode," said Vice Adm. Kevin Cosgriff, the commander of U.S. 5th Fleet, which patrols the Gulf and is based at nearby Bahrain. 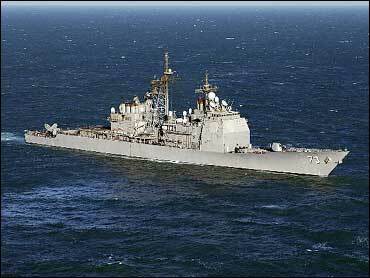 The Pentagon said five small Iranian boats repeatedly "charged" three U.S. warships - cruiser USS Port Royal, destroyer USS Hopper and frigate USS Ingraham - on what the U.S. Navy called a routine passage in international waters. It also said the Iranian vessels dropped boxes in the water and warned the U.S. ships that they would set off "explosions," a U.S. Defense Department official said. On Monday, Iran's Foreign Ministry called the incident a "normal" encounter between the two countries' ships and said it had been resolved. On Tuesday, senior Revolutionary Guards commander Ali Reza Tangsiri was quoted as saying Iran had the right to ask any ships to identify themselves upon entering or leaving the Persian Gulf. "It is a basic responsibility of patrolling units of the Revolutionary Guards to take necessary interception measures toward any vessels entering into the waters of the Persian Gulf," Tangsiri said, according to the Mehr news agency. "We are entitled to use our definite right in the Strait of Hormuz to take controlling measures in relation to the entry of any vessel into the Persian Gulf," he was quoted as saying.